Maine’s South Coast is known as the “Gateway to Maine” and is best known for its 30+ miles of sandy beaches, ranging from the bustling, family friendly variety to quiet, relatively unknown coves and undisturbed places of beauty. Beaches are just one of the attractions of the region though. The South Coast of Maine is also recognized for its shopping, dining, amusements and wide range of local arts and culture. Shopping in the Maine Beaches Region offers visitors a variety of options from the hundreds of stores that make up the Kittery Outlet Malls to the quiet downtown boutiques of Kennebunkport. It is also no wonder that the stretch of Route 1 running from York to Arundel is known as the Antique Mile with dozens of stores stock full of treasures just waiting to be discovered. While visiting the Maine Beaches Region, guests are treated to a milieu of culinary choices. There is an abundance of traditional Maine seaside fare such as lobster in drawn butter or lobster rolls overflowing with chunks of tender meat. Diners can try international faire prepared by renowned chefs from all over the world, choose a down home meal cooked behind the counter or enjoy saltwater taffy, pizza and hand cut french fries while relaxing at the beach. Kids of all ages will love the Maine Beaches Region amusements and midways around the area. Funtown/Splashtown, USA is home to the new Wild Mouse Roller Coaster and Palace Playland Amusement Park in Old Orchard Beach is the only remaining oceanfront midway in New England. Or head over to York’s Wild Kingdom to visit animals from all over the world, including a rare White Bengal Tiger, and then take a ride on the original carousel in the amusement side of the park. The fun doesn’t stop when the sun sets in the Maine Beaches Region either! Home to the Ogunquit Playhouse, the Maine Beaches Region boasts Broadway quality shows starring well known actors and actresses like Sally Struthers and Lorenzo Lamas. Additionally, the area has a plethora of entertainment venues showcasing acts from acoustic performances and piano bars to high energy bands keeping the dance floors packed until last call. The Maine Beaches Region is also the perfect destination to visit galleries and art associations displaying the works of local, national and international artists. As if there wasn’t enough to do, the Maine Beaches Region, because of its natural beauty and preserved seaside environment, is a wonderful place for nature enthusiasts and recreationists. Whether hiking, sailing, biking or kayaking is your thing, the area provides the ideal backdrop for your outdoor activities. The John Paul Jones Memorial in Kittery commemorates the site where in 1777 the U.S.S. Ranger was built and launched. The Old York Historical Society includes seven historic buildings dating back to the 18th century, including the Old Gaol, one of the oldest public buildings in the U.S. (1719). The Wells Auto Museum features more than 75 cars from 1900 to 1963, including gas, steam and electric powered vehicles. The Brick Store Museum in Kennebunk offers an architectural walking tour along Main Street and “Sea Captain’s Row.” Visitors will view a variety of 19th century architectural styles, both commercial and domestic. The Seashore Trolley Museum in Kennebunkport features the largest collection of trolley cars in the United States. The Old Orchard Beach Pier is an old fashioned boardwalk lined with shops, games, pubs and dining, and extends 1000 plus feet into the Atlantic Ocean. The Counting House Museum of South Berwick is a repository for documents, photographs and historic curiosities covering a wide spectrum of community life in and around the Berwicks, site of the first permanent settlement in Maine. The Marginal Way Scenic Walk in Ogunquit is a 1 1/4 mile breathtaking path along breathtaking views of the ocean along a craggy shoreline. Mt. Agamenticus consists of more than 10,000 acres and is located within an additional 30,000 acre expanse of conservation land in southern Maine and maintains miles of trails for hikers, bikers, equestrians and ATVs. The Cape Neddick Lighthouse (Nubble Light) is located on a small, rocky island a short distance off the eastern point of Cape Neddick, about two miles north of the entrance to the York River and York Harbor. Illuminated for the first time in 1879, the Nubble is one of the most recognized icons located in the Maine Beaches Region. The Rachel Carson National Wildlife Refuge was established in 1966 in cooperation with the State of Maine to protect valuable salt marshes and estuaries for migratory birds. The refuge hosts a myriad of events and activities and offers miles of trails for hiking and birding. Fort McClary, built in the early 1700s, is a series of ocean front buildings that made up a key defense site during the Revolutionary and Civil Wars. Visitors are invited to explore the property and remaining buildings, which includes the original Block House. Walker’s Point in Kennebunkport Maine is the summer home of 41st President of the United States, George Herbert Walker Bush. While not open to the public, Walker Point is visible from the water, and parts of the property from the road. The East Point Sanctuary in Biddeford Pool is maintained by the Maine Audubon Society, and is considered to be one of the premier birding spots on the northeast coast. Harvestfest in York Village is a three-day celebration in October each year that draws upwards of 40,000 visitors. Events include of live entertainment, juried crafts, a traditional ox roast, Kidsfest, a pumpkin stroll and fireworks. Patriots Day in Ogunquit celebrates patriotism with an annual Patriots Day Weekend celebration. Go back to the community’s roots, with historical characters walking the streets, musterings, and fife & drum concerts. There is also a craft show, tours of the Ogunquit Playhouse, a kids’ carnival, cookout, taste-tests, and casino night to round out the weekend. The Old Orchard Beach Car Show is held each September where hundreds of antique and classic automobiles are on display. The event offers trophies in 25 classes, music, food, games, raffle giveaways, 50/50 drawings, and other entertainment. Annual La Kermesse Festival in Biddeford – huge block party featuring traditional foods – late June. The Wells Chili Fest each August is a one-day event only featuring the Maine State Chili Cook-Off. The event is sanctioned by the International Chili Society and winners in various categories (Chili, Chili Verde, and Salsa) may qualify to advance to the World Chili Championship Cook-Offs 2009. Christmas Prelude in Kennebunkport is a spirited 10-day Christmas celebration packed with traditional holiday festivities including shopping, lighted walks, caroling, food, entertainment and a tree lighting celebration. This event rivals only the 4th of July in this small seaside community. Additional regional information may be found by calling 207-748-3203 or visiting the Maine Beach Association or check the calendar of events. For additional information about Maine please visit VisitMaine. MECOA is the premier resource for supporting campground owners and promoting camping in Maine. The Maine Camping Guide website and printed version of the Maine Camping Guide are products of the Maine Campground Owners Association (MECOA). 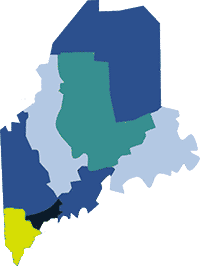 MECOA represents over 190 of Maine's licensed campgrounds. The offices of MECOA are in Auburn Maine and you may contact us here. MECOA accomplishes their mission by providing marketing, advocacy and educational tools to its members. MECOA has built this website for the convenience of the camping public and all of our members are represented here on this site as well as in the printed version of the guide which is available here in a digital format. MECOA marketing program for members is extensive.